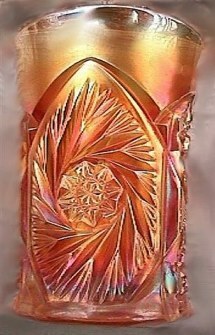 So few photos of Cambridge Carnival Glass examples exist in earlier written accounts. Jack and Mary Adams, along with the late Don Moore offered their knowledge to benefit collectors who were associated with Clubs through newsletters during the ‘70s and ‘80s. We hope that in providing the photos taken while visiting the Museum, along with our accumulation of research over our years of collecting, that newer collectors will realize the value in these pieces. Added to the usual collection of carnival glass from the “big five” producers, the Cambridge pieces lend an integrity and interest, which seldom surfaces except from the most advanced collections. 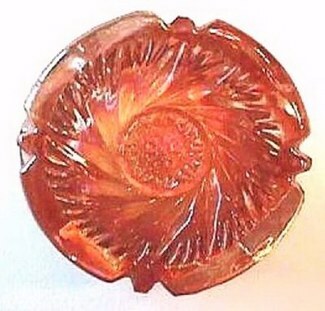 Many fewer in number overall than the Carnival Glass from more recognized companies , examples from this famous manufacturer are worth every effort to obtain! Ability to photograph to better advantage than in earlier times, along with new museums to further research promotes better awareness. 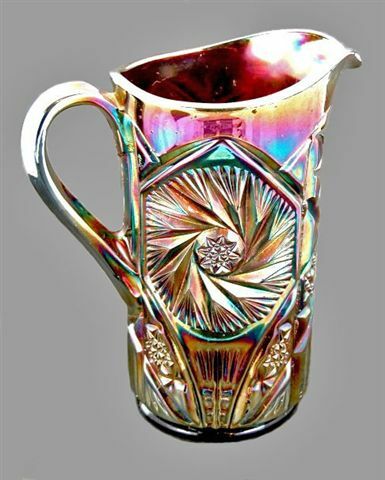 Education, combined with the availability from time to time, arising on Ebay , desire to collect Cambridge Carnival Glass should become more intensified. These are equal in crystal quality to any of the Millersburg pieces! BUZZ SAW and FILE – Characteristics are similar to Double Star, but attribution to Cambridge is tenuous at best. While the geometric design is much like Double Star, further research may lead to US Glass as the maker. 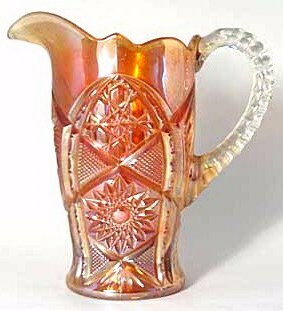 One of these pitchers sold for $150 on the Doty sale section of his site, in early May 2004! DOUBLE STAR - hobstar. Some pieces are marked “Nearcut”, a Cambridge trade name, large whirling star and a smaller hobstar. Some pieces are marked “Nearcut”, a Cambridge trade name. 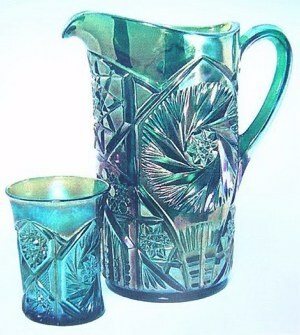 Water Set: is found in green (the most commonly found color), along with marigold and amethyst. Bottom design on this Doublestar tumbler is quite similar to the one on Buzz Saw & File tumblers. The Carnival specimens apparently entered the arena late in the scheme of iridization. 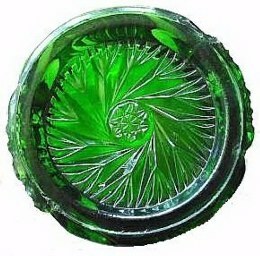 In essence, this is a tumbler with extruded sides, in green. It takes the “cake” for rarity in the pattern. Don Moore owned this piece for many years. Its whereabouts are unknown at this point in time. We show these seven photos of the Buzz Saw and File pattern for your consideration. Whether they are actually of Cambridge origin, we cannot confirm. 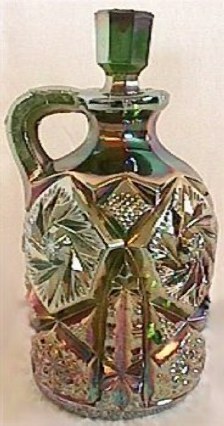 While they are unlisted in the few recorded files surrounding this manufacturer’s carnival glass, the pattern certainly resembles the one known as Double Star……….This water tumbler is 4 1/4” tall, with a 2 ¼” base. 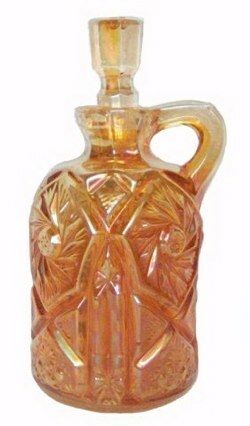 There are two other sizes: (Juice) 3 7/8” tall x 1 7/8” base and (Lemonade) 5 5/8” tall x 2 5/8”. All known examples are in marigold. This is a very scarce pattern. 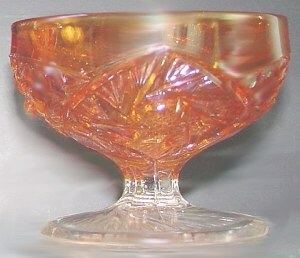 A footed goblet and a footed sherbet are very scarce items in this pattern. When and if more definite information becomes available, surrounding this pattern, we will most certainly update! 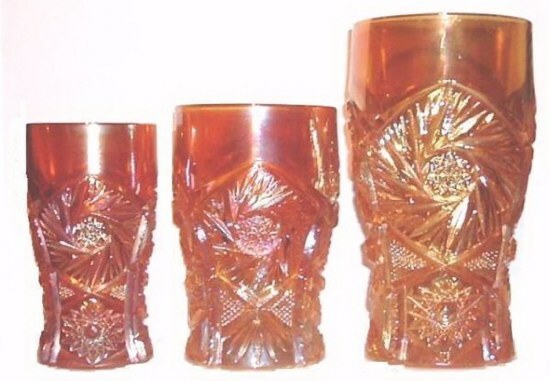 Bottom pattern of Buzz Saw & FIle tumblers and pitcher. BUZZ SAW & FILE tumblers left to right: Juice, Regular, Lemonade. Left - Buzz Saw Cruet - Green -Small size - only found in Green. Middle - Large size BUZZ SAW Cruet.Courtesy Rick & Debbie Graham. 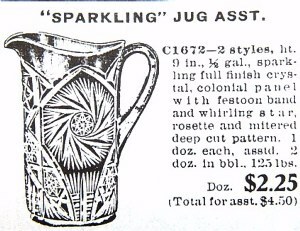 Right - Buzz Saw Cruet ad as seen in the Cambridge Nearcut Catalog. 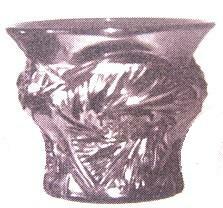 These cruets in two sizes were made first in crystal. (We have owned one each over the years.) In Carnival, the small cruet is found only in green. The large size is found in marigold and green, many times without stopper. So, should you find a stopper by itself somewhere, it could be worth more than the complete cruet! How these cruets came to be called Buzz Saw is a story we do not have for you, but they are said to be in the Double Star family.